Our "Make-It" Monday was a bit of a stretch this week. We "made" friends by inviting over 6 friends to play for the day. 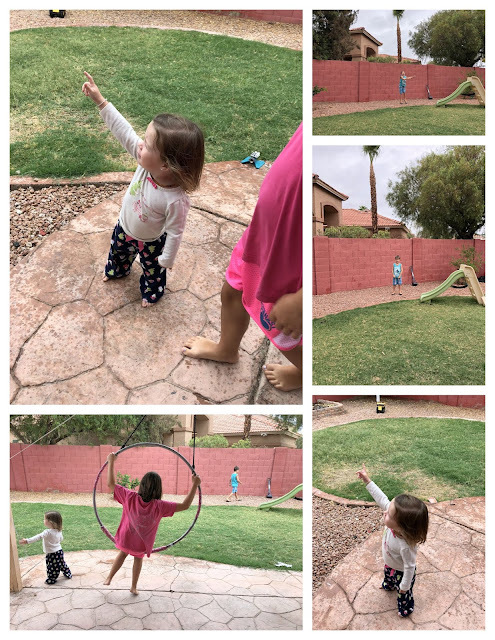 Amelia played with her cousin Anna and friend Brooklyn; Phillip invited over Anson and Ryan; Everett played with Gary; and Evelyn played with Isla (Brooklyn's little sister). We had a great afternoon just playing with friends. The kids played "pummel each other" with stuffed animals first. Splashed about in the pool for several hours to pass the afternoon heat. Isla and Evelyn got along famously! They mostly played Barbies to pass the time. I had several people ask me how having that many kids in one space is easy: it really is! The kids tend to take care of themselves, the resulting mess was quite fantastic. The kids consumed several boxes of fruit snacks and a case of soda. Ha ha ha. Sent them home hyped up on sugar. Everett taught our FHE lesson on sharing. We enjoyed some fresh rice crispy treats for our snack. Phillip was overjoyed his new glasses came in two days early! We picked them up after dropping Mia off at piano. He was thrilled to wear his new glasses, thrilled that everything was sharp again. He does look quite handsome in his new specs. The Bear den hosted a carnival for pack meeting. First off the den leader handed out earned awards to the boys. Phillip earned a new belt loop! He got to putt a golf ball using either a hockey stick, golf club, or a tennis racket. So silly! The bears set up several different carnival games in the gym for us all to enjoy. There was a paper airplane game, where as you tried to fly your plane another scout would shoot it down with a nerf gun. A frog jumping game, a silly game that involved wearing pantyhose with a ball in the toe on your head and knocking down water bottles, fishing, coin drop game, etc. The kids enjoyed candy and the games! nice job Bear Den. Wednesday the kids invited their cousins back over for a carnival of their own! Amelia and Anna organized a bunch of games like slip and sliding, apple bobbing, face painting, etc for all the kids to enjoy. I did the face painting! Evelyn requested rainbow eyebrows! Crack me up. The actual carnival only lasted about 30 minutes but was quite amusing while it lasted. I provided cream soda, chips, and licorice. We are so lucky to have family close by, especially happy they can come over on a whim to spend time and make memories. We went swimming to the boy's home swim team pool this week at Greenfield. Josie is really excelling with her skills. She puts her face in the water and swims underneath the water! I get a bit freaked out watching her try to swim and half the time fumble her feet and go deeper under the water. In our pool she refuses to wear her floatie, preferring me to carry her about and swim under the water. I was amused by a fun ray of light that skimmed my phone lens, made some of my photos look like Josie was getting beamed up by Scotty. Evelyn is pretty much a solid swimmer now! She can make it across the pool alone, she flips on her back when she needs a breath or a break. The older 3 kids played a spy game. The game involved asking me what I was doing and reporting back to the others. I enjoyed making up stories to report back for them. This week I finally signed up all the kids for the summer reading program. It took a chunk of time to enter in books and length of time they read for the month of June! Each kid earned free pizza, a free entrance to a national park, and a free book! They were all excited to earn something for their daily 20 minutes of reading. We can't wait to enjoy some free pizza next week. Around town are cute codes the kids can enter in their profile and earn more prizes. We found our first code at the pool this week. We worked on cleaning up the yard Saturday morning. Just regular torture as normal. We took the van and Hamster Wagon to get cleaned up in preparation for our vacation. Phillip and Josie went with us. Josie looked so adorable with her tongue sticking out as she concentrated on shooting the water gun at the cars going through the automatic car cleaner. Justin took the older kids out to see the Incredibles 2 movie Saturday night. I hear the movie was fantastic! Josie and I went to get some food for our trip at Smart and Final, a fun discount grocery store. The store caters to restaurants and bulk buying for ethnic foods. I picked up a huge package of crackers for half the price at Costco. While I was checking out Josie started singing "Monkeys jumping on the bed!" so loudly that lots of folks were looking at smiling at her. She was completely oblivious to the attention as she belted out, "no more monkeys dumping on da bed!" We agreed to run across the street for an ice cream cone. Yum. Our Sunday walk this week was a bit different than most. 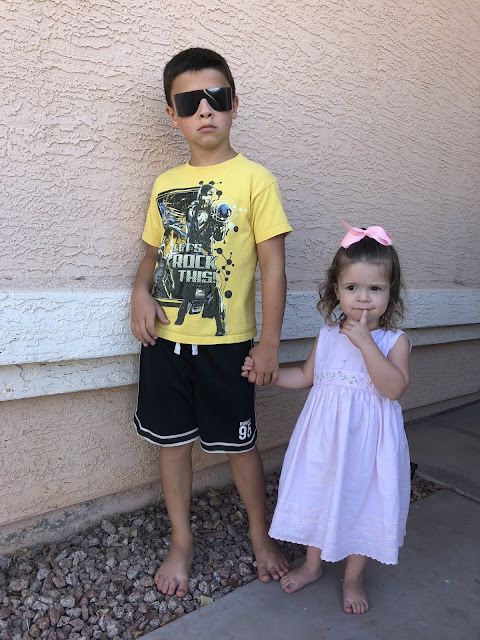 Josie had the kids collecting rocks for her. We started out the walk with Josie "walking" meaning she stopped every step to crouch down and whisper, "what's dat?" Her joie de vivre is so vibrant and contagious. We caught up to the rest once she was ensconced in the stroller. She decided rocks are cool so had the kids running about collecting cool rocks for her stroller tray. Some she rejected, other rocks she crooned over. So funny and cute. 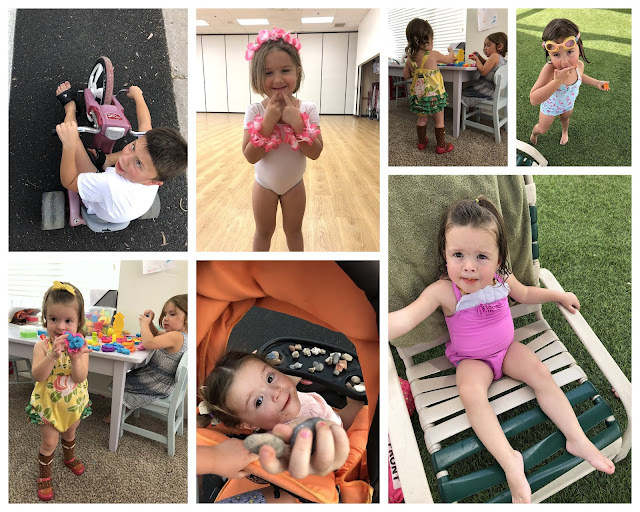 We had a fun Make it Monday this week. 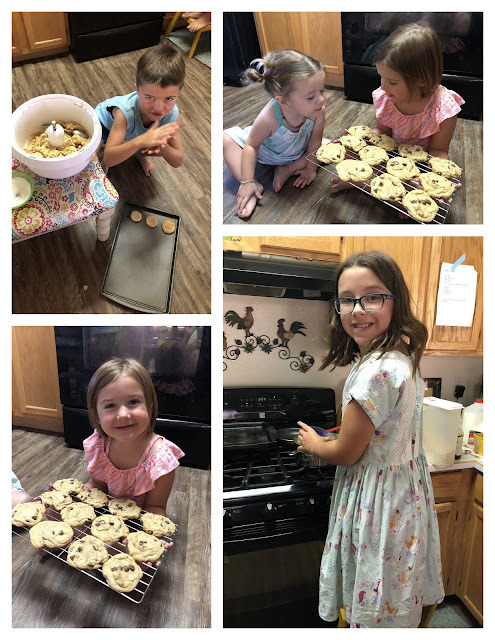 The kids chose their favorite cookie and I helped them make the cookie from scratch one-on-one. Evelyn went first making chocolate chip cookies. She loved measuring the ingredients and working the mixer. Amelia made no-bake cookies all on her own, just needed a bit of vocal support and clarification of the recipe. Yum! Everett made peanut butter cookies. His favorite parts were turning the mixer on super high and measuring out the dough, rolling it, and smashing it with a fork. Phillip finally decided to make root beer cookies with frosting. He was the least interested in the process but did really enjoy rolling out the cookie dough. By noon we had platters and platters of fresh, warm cookies. I caved and enjoyed some dough while baking and a cookie or two after baking. We played in the community pool, thanks to the Smith family for sharing their pool key! The kids loved the pool because it had a kidney shaped concrete slab in the center of the pool. For FHE we passed out plates of cookies to all our closest neighbors. That was the best part! Sharing the cookies. Tuesday Evelyn was so excited for Island Princess dance with her two new best friends. She got to wear fun flower bracelets and a lei for her class. Phillip was quite embarrassed I forgot a shirt for him since I picked the boys up from swim team right before dance. He stood outside the center for 30 minutes refusing to come in. I finally persuaded him to come in, a desk lady immediately targeted him about his missing shirt. I don't think he will forget a shirt next time! I dropped off my camera for cleaning and to calibrate my sigma lens since the focus was soft. Across the street from the camera store was a bread outlet. All the kids were "starving" so we went over to the store for a moment. The boys about died, so many options for ding dongs, cupcakes, twinkies, and candy. It was carb heaven for my deprived children. They each chose a favorite treat. I added in some bread and other treats we could enjoy later. After paying the clerk let me choose 3 free items so Phillip grabbed 3 bags of bagels! What made me laugh was the look of pure surprise to walk into a store that only sold bread items. After dinner we introduced Justin to our local library. He was able to get a library card after almost a year of living here. The kids love the play area and especially choosing books. Kids choose books much differently than adults do. I am so picky and take forever to choose a book. My kids choose books by just swiping a book here and there without barely a glance at the title. Wet and Wild Wednesday consisted of visiting a pool we passed on the way to drop off my camera in west Chandler. It was not a close pool but had more amenities than the ones closer to us. We had a lovely afternoon swimming in the sun. The temperature hovered near 110 so the air felt scorching when not submerged in the water. Normally the pools blast radio station music, the Nozema pool was tuned to a Show Tunes channel! I was in heaven singing along to songs most folks have never paid attention too. Josie practiced submerging her entire head underwater this time! She has learned to hold her breath underwater! Good job baby! She still hates her floatie and wants to swim all on her own like Evelyn. Evelyn can swim well enough to not need any floaties, even in our deep pool. Her swim teacher is teaching Evelyn to side breathe now instead of flipping on her back! She is a quick study. Thursday was a long day for us all. We started the day bright and early with swim team, the boys stayed until 9:30 and got a ride home with Sister Seebach. I hear they got breakfast at the Jr High and played UNO with her son Fox. I taught piano lessons from 8:30 until 9:30, the reason the boys needed a ride home. Right after lessons we loaded up in the van and drove to Scottsdale for an hour of play at AirTime trampoline park. All the kids loved the foam pit, Josie let me throw her into the pit over and over again! 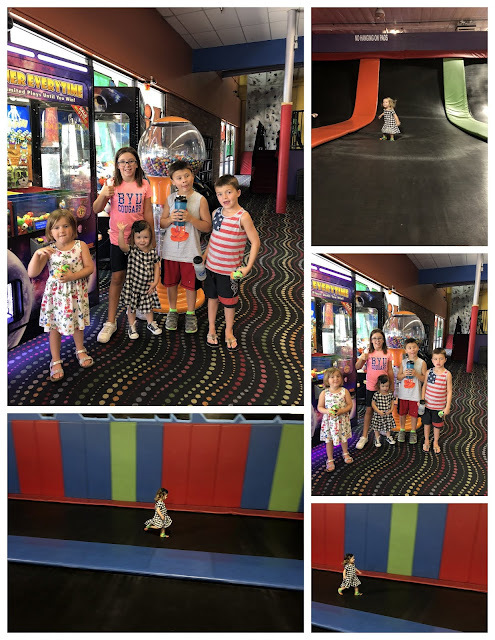 She had so much fun playing in the dodge ball room, mostly following around the balls and yelling out the ball's color. She had to give up the room once enough kids came in to play actual dodge ball. We met Justin for lunch at 11:45 since we were only a mile away from his office. We all loved seeing him during the day for an hour. Once at home I put Josie down for a nap. Chloe came over to spend the afternoon with Mia. Chloe and Mia babysat Josie for me from 1:30 until 5 pm. I took Phillip, Everett, and Evelyn over to the Payne's for the afternoon. I got to attend a temple session from 2:30 until 4:30. Our stake temple conference is this week and so the stake reserved a temple day on Thursday. Justin got to attend a session after work. I am so happy we could both go, although at different times. The photo posing challenge this week was to pose 2+ children in such a way as to see all hands, feet, limbs that can bend be bent, diagonal posing lines, no shoe soles, no creepy hands, and connection to their environment. Not daunting at all! I had some models lined up but they had to cancel last moment. I asked our neighbors Ranae and Warren if I could pose my girls next to their pool in their swim suits. I threw in the boys on a whim and somehow captured something amazing! All my kids looking cute with their summer sun-kissed skin and smiles. Our neighbors invited the kids to swim for the next hour in their pool. Ranae provided the kids with watermelon and towels. Jacob and Chloe also swam with our kids at the neighbor's invitation! 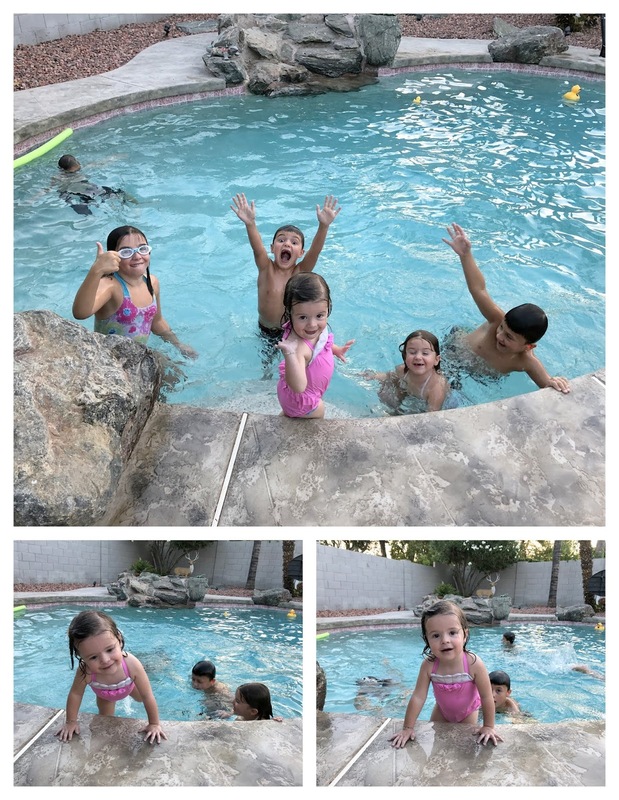 The last time they had kids in their pool was back in January! Ranae swears she loves hearing the sound of kids playing! Bless her heart. I enjoyed chatting with Warren about his accomplishments in life. He owns numerous restaurants in the mid-west. He started the pizza parlor and video game (think Chuck-e-Cheese) back in the 80s in Colorado. His new combination started a fire of new pizza parlor and game houses popping up all over the country! The kids swam until 8:30 pm. They also swam in our pool before and after dinner, tramp park, evening swimming, and a couple hours in the Payne's water slide. We were a bit tired on Friday. Ok, I was a bit more than tired. I was exhausted. No one responded to my call for Art class this week so I went ahead and cancelled it. Course after I did that two families texted me. We ended up just making some art with just my kids. That meant I did not need to clean the entire downstairs and make the kids help me. 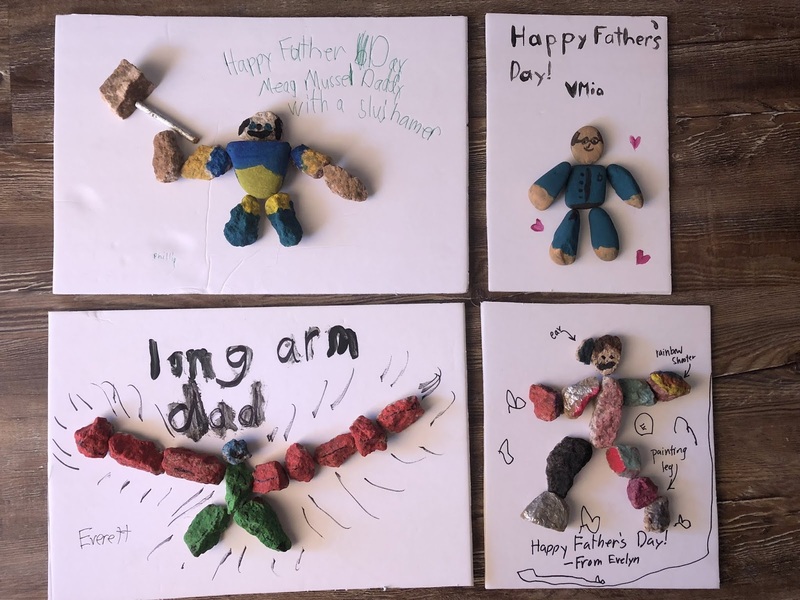 The kids wanted to make rock daddy art for Father's Day and fill out some questionnaires for Justin. I enjoyed just spending some art time with my kids. Phillip, Evelyn, Josie, and I went to Walmart for groceries. On a whim I stopped in to the vision center to get Phillip an appointment. They had a slot open right then so Phillip got his eyes tested. He squints now and then so I wanted to get him tested. 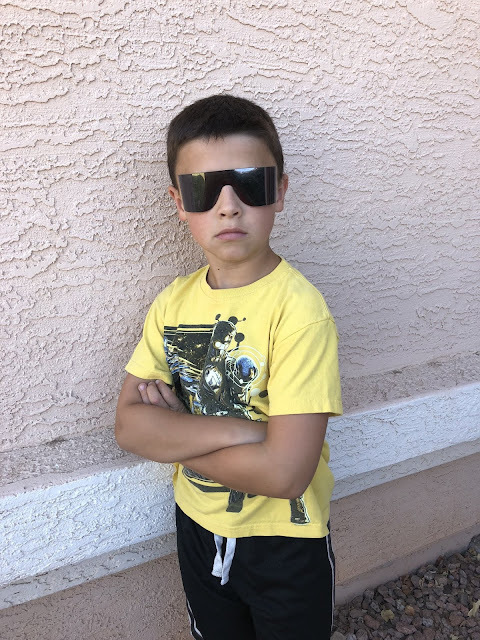 His vision is fine, the optometrist gave him a prescription for +.5 reading glasses for when he reads or does homework. Phillip got his eyes dilated, he scored some fancy roll up sunglasses! He looked so silly. Today he walked out of church wearing his baptism suit, a ninja turtle shell backpack and his roll-up glasses. Good gracious, he owned it! Phillip is over the moon excited to get glasses. After the optometrist we had to run fast to get groceries before naptime. We watched Wrinkle in Time as a family after dinner and a swim. LOL. The movie was pretty disappointing, I was hoping Disney would finally do the book justice, nope. Saturday we woke up to sprinkles of rain. 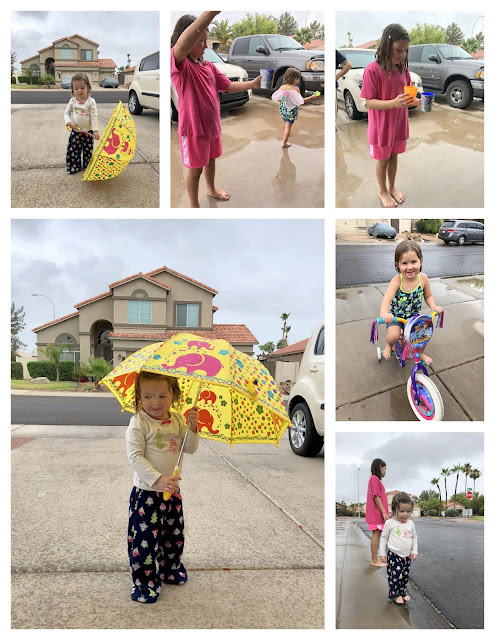 We had no idea rain in Arizona means a holiday! Neighbors came out of their homes to wonder at the miracle of rain. Josie acted like rain was a new phenomenon. She pointed and jabbered about the rain. We headed out to the front yard area to find our Indian neighbors also enjoying the rain. Before long all the kids were soaking wet. They enjoyed jumping in shallow puddles. Riding bikes through the puddles. Filling cups with the rain drops, and running amok with umbrellas. The temperature was so agreeable yesterday! A lovely 85 degrees while the rain lasted. After so many clear-sky days it was a welcome relief to have two overcast days in a row. After the rain stopped the party ended. It was like the holiday ended as well. We made the kids clean up the family room. I worked on washing the floors up, they were positively gross. I made Phillip's baby book, something he's bugged my to make for months now. I still need to make Evelyn and Josie's books. 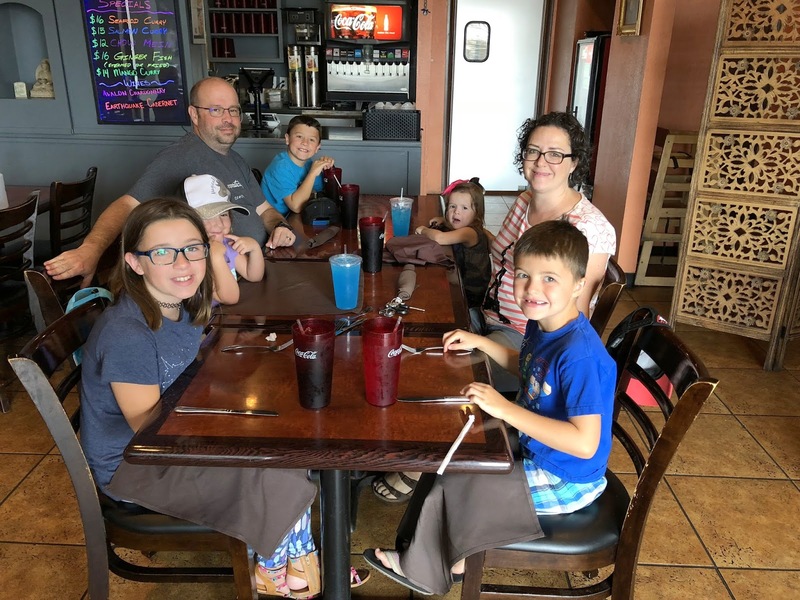 We treated Justin to Thai food for lunch in honor of Father's Day. Thankfully, two plates of fried rice and a family bowl of soup was enough to feed all the kids! Ha ha ha. The kids organized a dance contest boys vs girls. 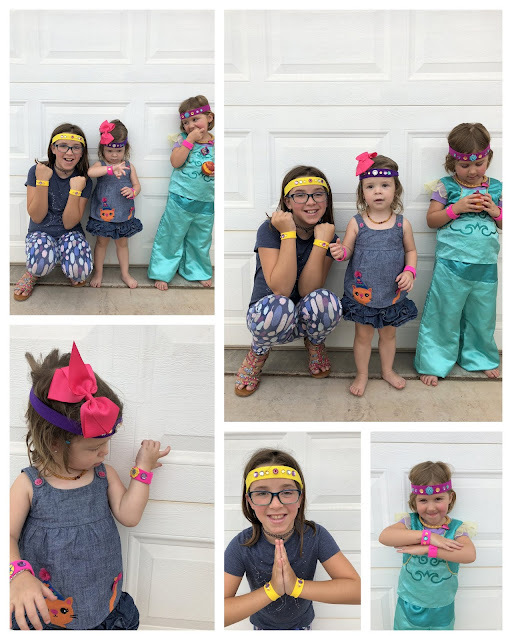 Amelia and Evelyn spent the time to make Shimmer and Shine headbands and bracelets for their performance. Each group danced to two songs. I was the judge. The boys danced to Shiny from Moana and One Foot. The girls danced to Shimmer and Shine theme song and Cheap Thrills. The girls won, they had organized choreography, costumes, and even fake money to throw around. Justin attended the training meeting of Stake Conference. Elder Mathias Held attended our conference as the general authority seventies. He is from Columbia but is of German descent! Today we attend Stake Conference at the Greenfield building. We chose to attend in the RS room, which ended up being an unwise choice. There was too much freedom to move about in that room. Josie unplugged the broadcasting cable once, Everett another time. The kids were constantly at the chalk board. 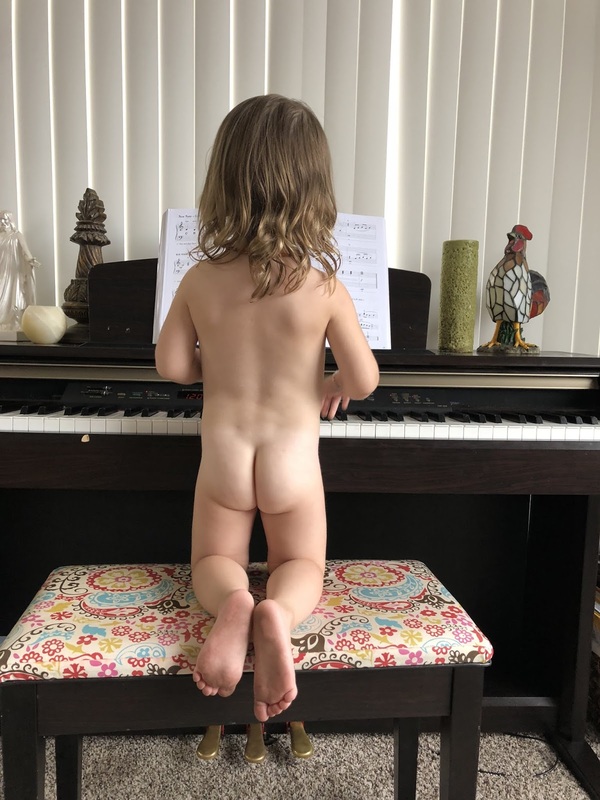 Josie played the piano more than once, got tangled up in the curtains, and cried loudly whenever she was made to sit down. Next time we will be in a pew, at least the kids are more reverent in a pew. The kids were so excited to share their Father's day gifts with Justin after church. I have a lovely steak dinner planned! We are grateful to have such a good dad! He is so reliable and diligent at providing for us all. Memorial Day, sickness cursed this year. Phillip and Mia came down with ear infections, Evelyn and Josie had stomach flu, and Justin badly hurt his back. Instead of a lovely hike we rolled around in the house watching TV and being bored. I went grocery shopping instead. Justin was fixing a damaged sprinkler head, his back/hip gave out in that awkward position. He was able to get 3 chiropractic adjustments, one that very evening at the Godard's home. We are lucky to have a chiropractor as good friends and neighbors. The kids splashed about in the pool for a diversion. Justin fussed about with the pool chemicals. He is learning keeping the chemicals balanced is quite the challenge, the hot sun burns off the chlorine quickly. I fixed up a fruit salad and hamburgers for dinner. As a treat I got some wood and Justin made a fire in our pit, s'mores it was! Josie was delighted to eat marshmallows off a dirty rod. Poor Phillip took a very late nap, his earache kept him up all night. Making s'mores is quite the magical experience. The gooey marshmallows, melty chocolate, and crunchy crackers, mmmmm. Justin stayed home from work Tuesday and Wednesday as well, had two more visits with Dr Godard. He worked from home a bit, mostly he stayed flat on his back icing it off and on. Phillip was his fetch-maid! Justin was quite amused when Phillip got him a glass of ice water with three straws, because Justin has a big mouth! Our no-tech Tuesday was lovely...I enjoyed taking a long break from photos and the computer. The kids stayed busy with all our activities in the morning. The kids stayed in the pool water for several hours to pass the time. Justin got reamed out several times for trying to watch TV on the big screen. He had to watch on his tablet. We cleaned up our house with all our extra time in the afternoon. Phillip met with Dr Melanie about his ear, got a strong antibiotic to help clear it up. She could not even see his eardrums because so much fluid was in his ears. I got some drops to dry out his ears after swimming and now make sure he is wearing his ear plugs. Evelyn started swimming lessons with Sister Price. We are practicing chicken, airplane, rocket, ice cream scoops, and daddy kicks! I already see improvement a week later. She can manage to swim without aid in our 4.3 foot deep pool. Josie was intent on swimming in the pool with Evelyn, she dipped herself without hesitation. Amelia noticed a new girl in swim team who was crying on her first practice day. Amelia completely sympathized! She went over and introduced herself, telling her story about her traumatic first day as well. I'm glad she had the nerve to help out a new friend in need. Right after swim team for Everett we headed to the Elementary school to retake the last day of school photos. Thankfully, the kids were good sports and I got those taken in a jiffy. We headed to the library to return all our books and get new ones. The library was still closed so we decided to spend some time playing at Riparian. The older kids soon had a complicated game involving lava and saving the world going on. We stayed around the play area until the library opened. Evelyn, Josie and I went to see the ducks. A group of ducks, led by a large goose...seriously...decided that Josie was hiding crackers in her diaper. They started to pinch her clothes with their beaks. She was largely freaked out by that experience. We quickly vacated their territory and went to watch the calmer ducks floating in the water behind the bridge fencing. Much safer! We met up with the Russo family at a splash pad for our water day activity at Founder's Park splash pad. It was really nice! Completely enclosed with shaded areas and seating for parents to watch. Amelia and Averie skipped about holding hands in their own girl world! The Phillip, Owen, and Jack started a pokemon battle with poke balls Phillip brought. Josie ran about darting into the water and largely enjoying her little self. I managed to capture Evelyn's devious face right before she dumped a bucket of water on Josie. I could almost see horns on her head. Everett disappeared into his own world, I struggled to catch sight of that boy. He found a friend to play with then kept himself busy targeting aliens with his imaginary guns. Josie somehow snuck out of the enclosure (with another family). One moment she was there, the next an angry lady was pulling her back into the splash pad area. She was almost purple with rage at me for negligence. Yikes. Josie made it to the parking lot alone. By far she is the hardest to keep track of, that girl is fast and can disappear in the flash. Thank you purple-faced lady who was really mad at me. I appreciate your well-aimed anger, you saved my Jojo girl. We cooled off with shaved ices before heading home. I spent all of Thursday dealing with the photo disaster. I ended up permanently losing more images than I thought to file corruption and file overwrites. By the end of that day I had all the lost images I could save re-edited. I was able to hand over three flash drives to Debbie on Sunday afternoon. Phew, that load is off my plate now. I did order a large canvas and large prints of one image I totally lost but happened to order at Costco, who had the full-sized file. Chloe and Ronald invited Amelia, Phillip, and Everett over for the afternoon to play at their home. I hear the kids got to swim in their pool and play with cool electronics we'll never own. Mr Nguyen took the kids out for a McDonald's treat as well. With the older kids gone I was able to buckle down and get lots of work done, fast. Evelyn amused herself for two hours with her barbie dolls. I love that kid! Josie is slowly learning how to pedal her trike. I attach a bungee cord to the handle bars to help her pedal since her feet don't quite reach. I pulled out the slip and slide for the little girls to enjoy while the olders were gone. They had a blast splashing in "muddy puddles!" Josie actually slipped a few times, each time made her giggle and laugh. Friday afternoon we hosted our first Art Academy. I taught a lesson on oil pastels. First we learned about oil pastels and crayons, the difference, and history. Our project was to draw an abstract design then color in the voids with three colors in the same family. We used baby oil to blend the pastels even further. One set of pastels I had on hand were terrible, oddly, the cheap set blended much better than the expensive set. The project seemed to overwhelm the kids, most giving up after 10-15 minutes. We had 10 kids participate this week! Hooray! Can't wait to teach about watercolors next week. Justin came home with a bouquet of flowers for me. Lovely! He puts up with my lack of nursing skills, I'm sure he deserved the flowers more than I did. Our weekend was a repeat of Memorial Day, lazing about and making messes. Justin is moving around more but is still in a bit of pain. We watched more TV than is healthy. I worked on cleaning the disaster garage mess. It was steamy hot out there! Took me a while to dismantle the sewing station, sort dress ups, get Legos back in their bins, and situate Phillip's collection of Imaginext. Justin bossed the kids around in the backyard like a disgruntled drill sergeant. He was doing such a good job all the kids nearly expired from hard work and movement. My eyebrow scabs finally started to fall off. The scabs itched terribly in the heat! Now my brows are much lighter and look quite natural. I am very pleased. Towards evening I had a photo session with the Jackson family. We did family photos then a bubble bath for their newly turned 1 year old. So much fun. Our stake held a special fast for rain to lessen the drought enough so the youth summer camps won't be cancelled. Most of the campsites in AZ are closed this year because of extreme fire danger. Mia fasted the afternoon! Sunday evening we watched the "Be One" broadcast. I was impressed with the Bonner family! So many folks dressed up in white. 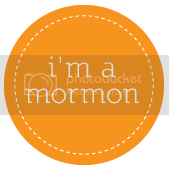 We all felt uplifted while listening to the story about the Blacks in the LDS church. The kids wanted to camp out in the living room, Justin was Mr Grumpfish and refused to let the kids use a tent. He finally relented after an hour. He set up his very first tent he got back in 2000 after BYU graduation. The kids were elated to sleep in the tent. Thanks for changing your mind Justin. Amelia had a terrible night due to her worsening earache. I was in Jojo's room since she kept crying and waking up the kids. I got to sleep on her floor. Mia was groggy enough to not fetch some pain relief herself, or ask Justin for help. We went to the Dr again come Monday morning.